The purpose of this collection is to guide undergraduate and graduate students in the area of Islam, including the historical, religious, artistic, and contemporary social issues shaping the religion. Special geographical coverage is given to the rise of Islam in the ancient Near East, however, the collection includes resources on Islam in the USA and the West. The collection includes open access sources and library materials available in a variety of formats such as databases, maps, and books. Please contact Shatha Baydoun, Liaison Librarian, for an individual research consultation or for more information about Islamic resources in the library. Ahlul Bayt Digital Islamic Library: Provides very good primary and secondary material on Shia Islam including Nahjul Balagha. Al-Islam.org: A comprehensive website with searchable Qur'ans, virtual hajj, Sufism, maps, and biographies of scholars. Islamic Philosophy Online: Provides resources on the philosophical output of Islam ranging from the classical texts to modern works. Muslim Heritage: A comprehensive collection of classical Islamic texts covering areas such as astronomy, mathematics, social sciences, and medicine. The Qur'an: The complete book with searchable Arabic and English text. Columbia University Middle East Studies Internet Resource Guide: Covers all disciplines in the study of human societies, past and present, in Morocco, Tunisia, Algeria, and Egypt, the West Bank and the Gaza Strip, Lebanon, Syria, Iraq, Jordan, Kuwait, Saudi Arabia, the United Arab Emirates, and Yemen. Electronic Tools and Ancient Near East Archives (ETANA): An interdisciplinary resource for the study of the Near East including the Ancient, Biblical, Classical, and Late Antiquity eras. Internet Islamic History Sourcebook: A collection of public domain and copy-permitted historical texts, edited by Paul Halsall at Fordham University. University of Georgia Research Guide in Islam: A collection of primary and secondary sources maintained by the UGA Virtual Center for Interdisciplinary Studies of Islamic World (VCISIW). Brill Dictionary of Religion: Multimedia reference source of a variety of religion and religious phenomena. Encyclopedia of Islam: Articles on Muslims, tribes and dynasties, crafts and sciences, political and religious institutions, and the geography, ethnography, flora and fauna of various Islamic countries. Encyclopedia of the Qur'an: Combines alphabetically-arranged articles about the contents of the Quran including Quranic terms, concepts, personalities, places, names, cultural history and exegesis along with essays on themes and subjects within Quranic studies. Encyclopedia of Women and Islamic Cultures (EWIC): A database on all facets of life (society, economy, politics, religion, the arts, popular culture, sports, health, science, medicine, environment, and so forth) of women in Muslim societies. Index Islamicus: An international bibliography of publications in European languages on all aspects of Islam and the Muslim world. Academic Onefile: A great source for peer-reviewed, full-text articles from journals and reference sources. Academic Search Premier: A multi-disciplinary full text database containing full text for nearly 4,500 journals, including more than 3,600 peer-reviewed titles. Anthropology Plus: Covers anthropology, archaeology, and interdisciplinary studies. Includes Anthropological Index: 1957-present & Anthropological Literature: Late 19th century to present. ATLA Religion Database with ATLASerials: A collection of major religious and theology journals by religion scholars in the U.S.
Bibliography of Asian Studies: The Bibliography of Asian Studies (BAS), references principally western-language articles and book chapters on all parts of Asia and in most disciplines published since 1971. Encyclopaedia Iranica: A comprehensive research tool dedicated to the study of Iranian civilization in the Middle East, the Caucasus, Central Asia, and the Indian subcontinent. Historical Abstracts: Historical Abstracts indexes and abstracts journal articles and dissertations on world history from 1450 to present excluding the United States and Canada. International Medieval Bibliography: Includes the International Medieval Bibliography and International Bibliography of Humanism and the Renaissance. Iter: Gateway to the Middle Ages and the Renaissance: Contains over 225,000 records from more than 400 scholarly journal titles pertaining to the Middle Ages and Renaissance (400-1700). JSTOR: Provides digital versions of the backfiles of major scholarly journals. Oxford Reference Online: Contains about 100 general and subject dictionaries, and language reference works published by Oxford University Press. ProQuest Research Library: Provides in-depth coverage of the top 150 core academic subject from 1971 forward. Social Sciences Citation Index: Provides international, cover-to-cover indexing of the most cited journals in social sciences. The Libraries’ at UM feature an extensive collection of print and E-books that explore the religion of Islam from various lenses including women studies, law, politics, empires, and multidisciplinary methodologies. ARTstor: comprised of contributions from museums, individual photographers, scholars, special collections at libraries, and photo archives. All images are accompanied by comprehensive metadata and are rights-cleared for educational use. Casselman Archive of Islamic and Mudejar Architecture in Spain: Contains thousands of color slides and black-and-white photographs of medieval Spain taken by the late Eugene Casselman (1912-1996) during his travels throughout the Iberian Peninsula. Index of Medieval Art: Includes images and descriptive data relating to works of art produced between early apostolic times and the sixteenth century, as well as art from medieval Jewish and Islamic culture. Islamic Arts Magazine: A website on modern Islamic art in various formats and mediums. 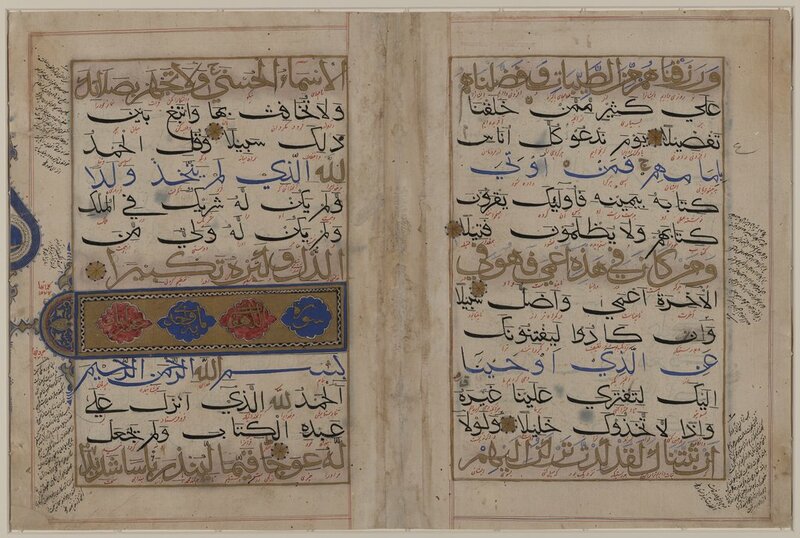 Islamic Heritage Project: Religious text dating from the C10th from various parts of the Islamic world including Turkey, Iran, Iraq, Syria, and Lebanon. Minassian Collection of Qur’anic Manuscripts: A collection of Qur’anic folios dating from the C9th and a collection of miniature paintings popular by the Persian, Mughal, and Indian traditions. Pattern in Islamic Art: A collection of patterns and designs featuring decorative arts from the Islamic World. AWMP (Ancient World Mapping Center): A great window into the ancient world with an Antiquity À-la-carte application that allows the user to create their own maps. Columbia Gazetteer of the World Online: A full-text database with detailed descriptions and statistics on thousands of countries, cities, mountains, rivers, and every other kind of political area or geographic feature. Perry-Castaneda Library Map Collection, University of Texas: Provides a well-organized collection of historical and current maps worldwide. 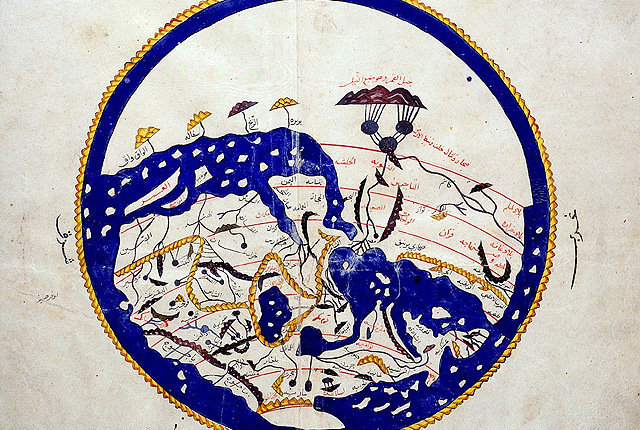 All maps are in the public domain, and may be freely downloaded and copied.